Children can often feel powerless in a situation like a big move, which is instantly daunting. Be sure to sit them down and inform them of your plans as early as possible; this will give them time to consider and accept change. Perhaps bring them along to potential house viewings (where possible) so they can feel fully involved and part of the process. You could even let them select their new room and help them to create a ‘wish list’ stating all the things they would like their new room to feature. Even if the list is ultimately unachievable, it will encourage them to treat the process as their dream move too. When packing up, try to give your child their own tasks and responsibilities as this will give them back some control over their situation. 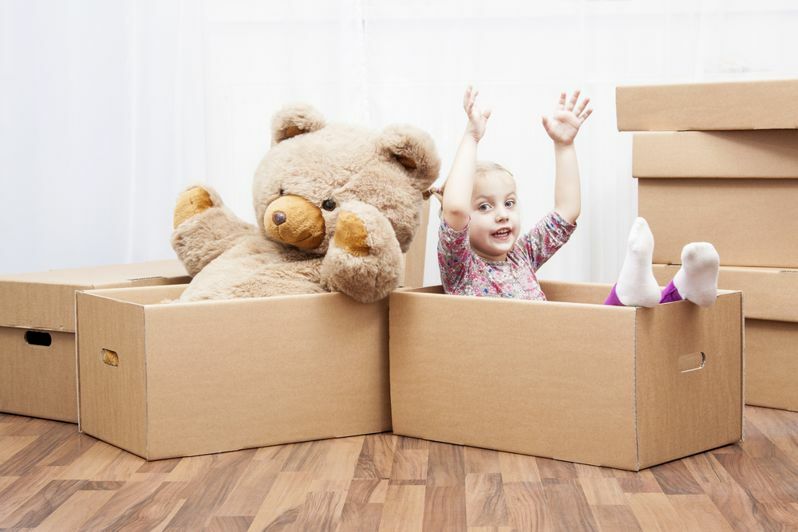 Let them pack away their own toys and encourage them to clear out any old ones as they go – helping you with the necessary pre-move purge. Add a little magic to the process and ask your kids to pack a ‘treasure box’ containing their most important and special items; if desired they can decorate the box with stickers and gems too, keeping them quiet whilst you sort out the kitchen! *Make sure that when you load up the car (and removal van) the children’s toys are the last items to be packed on, so that they can be easily accessed upon arrival. It may save you from a tantrum further down the line! If you are moving to an entirely new area, perhaps organise a leaving party for your children and their best friends so that they can have one final hurrah before the move! It may be an idea to take plenty of photos of friends, your current home and all of your child’s favourite neighborhood hangouts (if they’re old enough) or simply their favourite park and ice cream shop if they’re still little. You can encourage your kids to make a scrapbook out of the photos you take, which they can decorate and ask their friends to sign with sweet messages and details of their telephone numbers so that they can all keep in touch. *Take your children on a neighborhood tour before you go, so that they can make the most of the area before they say goodbye for now! Ideally, you may be able to have family or friends look after your children on moving day so that you have one less thing to worry about. If that isn’t possible, ensure that you keep your child in the loop as you progress through the day and try to keep them as involved and entertained as possible. For babies and little ones, make sure all feeding and changing equipment is easily accessible so that you can maintain their routine as best you can. Make sure you have their ‘treasure box’ to hand and encourage them to surround themselves with a few items once they find themselves in their new room for the first time. Forget unpacking the big stuff, start off with the small and important bits (slowly, slowly catchy monkey!) The first night in a strange house can be hard, so make it special for the entire family. Treat yourselves to your favourite meal (takeaway might be best, for ease and simplicity) and spend time together: unpacking can wait until morning. Once you’ve settled in (and unpacked a box or two) try going out for lots of family walks and little adventures to help everybody familiarize with new shops, parks and the local community. It will take a while for you all to adjust to your new surroundings – so have patience. Communicate with your children and encourage them to talk about any anxieties and concerns they may have. Above all, try your best to maintain routine. While children are adjusting to their new home, a new area and maybe a new school too, you can provide comfort by keeping things as normal as possible. Finally, help your kids to make new friends by encouraging them to participate in after school clubs or local community groups and projects. Through this, you can explore new surroundings together and it will encourage you and your kids to make the effort to speak to new people and neighbors. Each and every step will help you all to feel much more at home. Previous Previous post: Are you addicted to moving house?